Eye muscle surgery is done to correct strabismus. Strabismus is the term used to describe any condition in which the eyes are not parallel, whether one eye turns or wanders in or out, or up or down. The type and amount of surgery done will depend on the child's measurements that are done in the office. A few days before the surgery, a nurse from Same Day Surgery will contact the parents of the child. He or she will confirm the scheduled surgery time and what time the child should arrive at the hospital on the day of surgery. The parents should bring a physical exam form that has been filled out by the patient's pediatrician within 30 days prior to surgery. On the day of the procedure, the patient should wear comfortable clothing and wear no jewelry, eye make-up or fingernail polish. Eating and drinking instructions are age-specific and are found in the Same Day Surgery guide. If the patient takes any medications routinely, they can usually take the morning dose with a sip of water. Notify the doctor of any morning medications prior to surgery. A doctor or nurse practitioner from the anesthesia department will talk to the parents about the anesthesia. They will also answer any questions the family has. The procedure will take place in the operating room. Children who are over one year of age may have one parent in the operating room with them as they fall asleep. This is dependent on the child's state of health as well as the discretion of the anesthesia provider. The child will be asleep for the entire operation and will not feel any pain or any other sensations. He or she will be monitored by doctors and nurses throughout the procedure. After the child is asleep an IV will be placed to provide fluids and medications. A small metal clip is used to hold the eyelids open. No incisions are made in the skin and the eye is not removed at any time during the procedure. A small opening is made on the clear membrane covering the white part of the eye. Through this opening, the doctor will operate on the muscles that control the movements of the eye. When the doctor is finished he or she will cover the muscles with clear membrane. There are no stitches to remove because they will dissolve on their own. 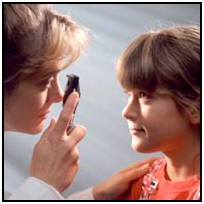 The ophthalmologist will speak to the parents as soon as he or she has completed the procedure. At this time, the doctor will provide post surgery instructions including the use of eye drops and ointment to help with healing and prevent infection. Your doctor may also give specific instructions about follow up care. The child will wake up in the recovery room. A nurse will call for the parents as soon as the child awakens. The child's eyes will be red after surgery. This redness lasts for several weeks as the eye heals. He or she may have blood-tinged tears for the first day after surgery. There may be some swelling of the eyelids. The child may also experience double vision for several days after surgery. Offer the child clear liquids (water, apple juice, jell-O, popsicles) when you return home. Gradually return to a regular diet. It is not unusual for children to feel sick to their stomach after surgery. Children may be tired and fussy for a day or two after surgery. Normal activities may be resumed as tolerated. The child may return to school or day care one or two days after surgery unless otherwise directed by the doctor. The child's eyes may be sensitive to light. He or she may want to keep both eyes closed a lot and may squint often. This may occur for one week or more. If necessary, keep lights dimmed or have the child wear sunglasses. Tylenol may be given for relief of pain and relief of mild fever. A mild fever of 99 to 100 degrees is not unusual, however if the fever persists or gets higher, the parent should contact the doctor. A cool, damp cloth placed over the eyelids can help to soothe eye discomfort.